Manufacturers tend to favour sequential throughput benchmarks, but real-world performance can vary depending on the type of data being moved to and fro. 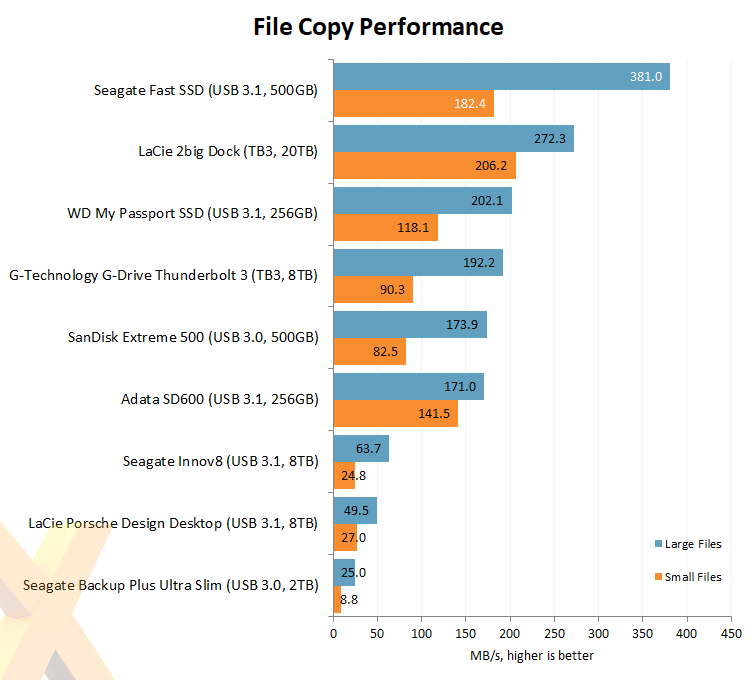 Our second test sheds light on two potential workloads; copying across a folder containing large files such as ISOs; and copying across a program folder full of various small files. Seagate's solid-state portable is once again one of the best performers on show. ...the only consideration for would-be buyers is whether the advantages of solid-state technology warrant the premium. The Seagate Fast SSD is one of the best portable drives on the market today. Available in capacities of up to 2TB, the sleek-looking device is small, light and capable of speeds in excess of 500MB/s when connected via forward-looking USB Type-C. Creating a capable external SSD shouldn't be difficult, but Seagate has dotted the i's and crossed the t's. Outside of extreme ruggedness, Fast SSD offers just about everything we'd want from a portable drive, and the only consideration for would-be buyers is whether the advantages of solid-state technology warrant the premium. Hard disks remain the more affordable option, but once you've tasted the speed, silence and resilience of an SSD, there's no going back. Bottom line: in the market for a sleek, quick and spacious portable drive? Seagate's Fast SSD ticks all of all those boxes. 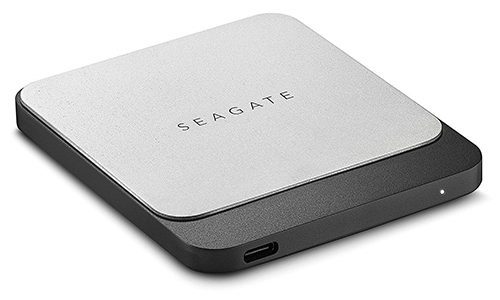 The Seagate Fast SSD is available to purchase from Amazon. Possibly one of the more important parameters for portable storage. That was literally the first thing that crossed my mind when I started reading the review. Depends entirely on how you store it. Even an sram chip retains information for an hour if stored in liquid nitrogen so flash would probably last centuries, but flash only lasts for hours if stored in the oven. It sounds like there might be a JEDEC standard model in JESD 47 but I'm not interested enough to stump up money to read it. JEDEC figure based on Intel data is one year if stored at a rather warm 30C. Looking down that table, you roughly double the retention time if you drop the storage temperature by 5 degrees which makes sense given it is down to electron mobility in the flash cell. So 2 years at 25C, 4 years at 20C. So stuff it in the fridge and you could be looking at 30 years retention time. My freezer says it is at -20C, if the data isn't still there in 1000 years feel free to post on here and complain. If I am still on here, even as a brain in a jar, I will happily apologize for my misunderstanding the table and lack of interest in researching relevant standards. Edit: I did leave a Force GT SSD in the garage for probably a year which does get rather hot in summer, and on sticking it into a PC it booted into Windows fine. It is arguably more important than read/write speeds for a portable device, but of course not such a headline grabbing parameter for the marketeers. £540 is simply far too expensive!! £100-£150 and I'll snap one up.